Our JDB (Joe’s Dairy Bar) Originals are made by us, by hand, from scratch on our premises using our own soft serve ice cream. We bake the cookies and brownies from scratch. 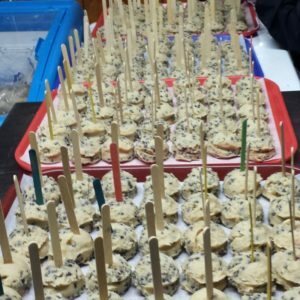 The raw edible chocolate chip cookie dough, raw edible brownie dough, muffins, loaves, cupcakes, etc.? Ditto. The JDB Originals are perfect for entertaining, whether during the holidays or just any ol’ day! You can stock up on your favorites and enjoy them in the comfort of your own home. You can even place orders in advance for any of these items whenever you want! We’ll schedule a pickup date and time when you place your advance order. 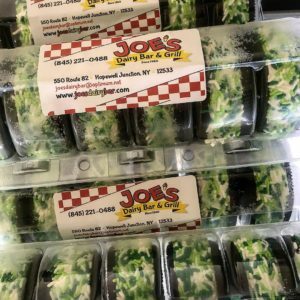 You can place orders by calling 845-221-0488; contact us via our website; via Messenger on Facebook; even via DM (Direct Message) on Instagram. Don’t see something you want down below? Ask us to make it! We’re always out to make the JDB Family happy! 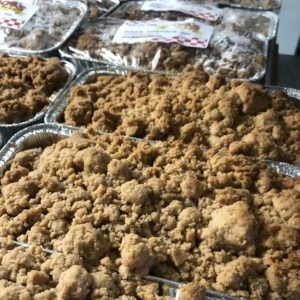 We bake quite a few delicious delicacies on premises, including our Crumb Cake and Chocolate Chip Cookies. (See immediately below). 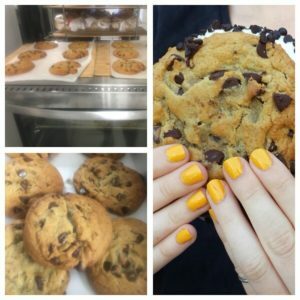 Keep in mind, the cookies we make to order for you can have mini M&Ms in them, Reese’s Pieces, and more. We can also make Peanut Butter Cookies, Snickerdoodle Cookies…. Really, our Designer Dessert Department can craft nearly anything you and your tastebuds would like! And just so you know, cookies can be dipped in chocolate, bedazzled with sprinkles, luster dust (edible glitter) and so on. 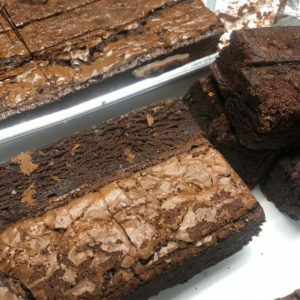 Ooey, gooey rich and chewy Brownies baked on premises? Mmmm-mmm! These brownies can be made to order, decorated or not (see cookies, above). They’re the same exact brownies that are used in our regular sundaes and even in our Freak Sundaes. And the Cake Pops? Out of this world! 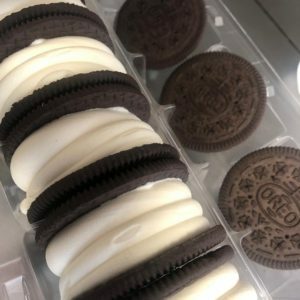 They are bite-sized bits of bliss that you can have covered in a variety of toppings and colors as giveaways at showers, parties and more. Don’t forget about the holidays! JDB Originals include holiday and seasonal offerings. Is it February? We can do Valentines’ Day goodies. Knock your loved ones’ socks off. Is it March? 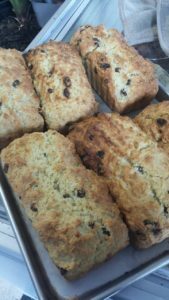 St. Patrick’s Day isn’t complete without our Irish Soda Bread. It sells out on the regular. Is it April? 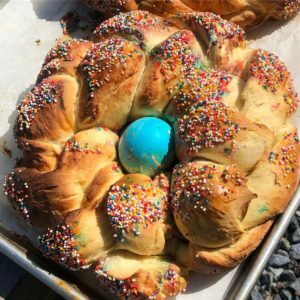 Our Easter Bread with one randomly colored Easter egg will give your (or your Host/Hostess’) table a holiday upgrade. Our Designer Dessert Department can serve up all sorts of seasonal sassiness with flair. You’re only limited by your imagination. But wait! There’s more! (Don’t slow that scroll). Both our Oreo Cookie Sandwiches and our JDB Saucers (think “Flying Saucers”) can be tricked out all sorts of ways! You can have them plain, sure, but…live a little! Want seasonal or holiday themed colored sprinkles? Done! Crave them rolled in any of our toppings? Why not? Desire them with any of our 37 flavors of hard ice cream as opposed to our soft serve? OK! Note: Our JDB Saucers come in a package of six and will automatically be half chocolate soft serve and half vanilla soft serve. Want them in all one flavor versus another? You need only ask! Behold the Monster Cookie, a JDB Original that has taken Dutchess County by storm! 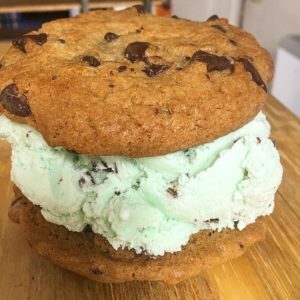 Twice the size of a commercially available Chipwich©, it’s constructed of our fresh-baked chocolate chip cookies (see above) and our multiple-award-winning soft serve. 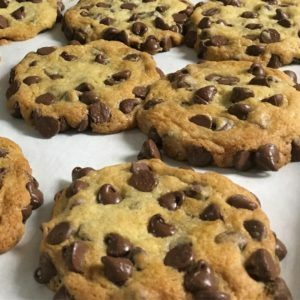 The Baby Monster Cookie is for those who want something along the lines of a fresh-made Chipwich cookie©…but want it made from scratch by Joe’s Dairy Bar and Grill! Can you get either of these mouthwatering Monsters with any of our 37 flavors of hard ice cream instead of soft serve? Yup!